It’s that time again, isn’t it? The moon is in the 7th House, and Jupiter is aligned with Mars. Summer’s comin’, dude. Relax, crack open a cold one and get “baked” - Clam Baked, that is. Invite your friends over for a typical New England summer culinary experience. Or head down to the beach and get “baked” by the shore. (Penfield 2 in Fairfield allows it, Compo Beach in Westport also, some others too!) A clam bake is a great way to enjoy the best of New England and the perfect way to entertain. Birthdays, rehearsal dinners, anniversaries, graduations, start of summer, middle of summer, end of summer, because it’s a Thursday, the list goes on and on. There is always a good reason for a clam bake and there are several great seafood suppliers in Fairfield County. The afternoon sun begins to droop wearily in the sky and your guests are arriving, kicking off their flip flops, and dipping their toes in the Sound. Waiters approach with cocktails and hors d’ oeuvres. As a gentle, warm breeze begins to blow, the buffet is announced and you approach long tables with steamers, mussels, clam chowder or cool summer gazpacho, crunchy baguette and crisp, garden salad. Enjoy. But the meal has only just begun. For the staff are busy, on site, steaming hard shell lobsters, boiling corn on the cob, and slicing Outdoor Cooker’s signature potato/leek and cheese pie. (For those who prefer, Outdoor Cookers also offers a chicken or steak alternative - advance notice required.) And as the sand crabs dare to poke their claws out from their tiny sand tunnels to greet the ensuing twilight, dessert is served. Light dessert, as that is surely ALL that you will want after such a feast, consists of fresh fruit salad, tangy lemon bars and the like. And finally, a hot steamed towel is handed to each guest. Perfection. Of course, perfection has a cost and Outdoor Cookers charges approximately $50-$60 per person. Prices may vary according to the market and holidays like Memorial Day, 4th of July, and Labor Day are slightly more expensive. You can speak to Mr. Gil Martin about particulars and there are a few ways to cut costs. If you prefer a slightly more casual affair, the price drops if you are willing to use paper goods (as opposed to the china that Outdoor Cookers normally uses.) Just call, Mr. Gil Martin well set you up! From the most upscale to the most basic “bake” now…the kind where YOU are doing the “baking.” Fjord Fisheries, both in Cos Cob and Westport, offer the “Clam Bake to go” - With this option, they are lending you the pot, the burner and the propane tank (which need to be returned the next day). You pick up your orders at the Fjord Fisheries Market (either 158 East Putnam Ave in Cos Cob or at 1835 Post Road East in Westport) and clam’s your uncle! Their prices drop to $40 without the clams and oysters, to $38 without the clams, oysters and shrimp, and to $36 without clams, oysters, shrimp and soup. But my advice is to go for the whole package. Otherwise, you’re skimping on some real clam bake traditions. Fjord’s, of course, also does a catered clam bake that is purely top notch. But they suggest that you call them as the choices and options can be altered according to taste. Obviously, the prices go up considerably with the “staffed” option. But with the staff, you are also supplied with the plates, cutlery, drinks, etc. Much more convenient. Much. Got the munchies yet? The Clambake Connection out of Stamford offers 3 options. They staff their events no matter which option you choose and the prices vary depending on the number of guests. The prices drop considerably when more people are invited. For example, in option number one, 10-12 adults (and one staff) is $51.95 per person where as 35 or more adults (and 2 staff) is $28.95 per person. 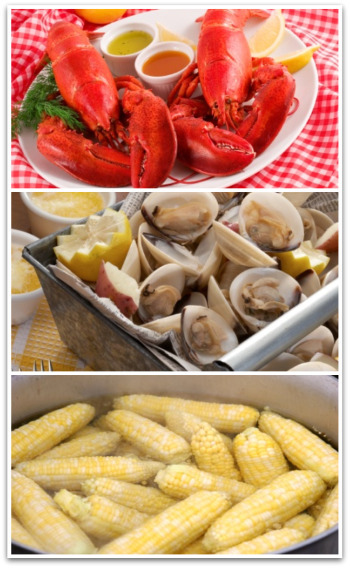 The options at the Clambake Connection vary but the gist is this - Option #1 offers a choice of lobster or chicken, plus clams/mussels, steamed potatoes, corn, and watermelon. Option #2 is slightly more expensive and here you can enjoy the addition of crudités’ with dip, chips and salsa, New England clam chowder, soda, and bottled water. Option #3 is the “clam de la clam” at the ClamBake Connection. With this package, along with everything in options 1 and 2, you also get a Raw Bar- clams and oysters on the half shell (with shucker), and shrimp cocktail. As would be expected, the price for this option will run you anywhere from $41.95 per person to $72.95 per person. The caterer supplies you with staff, equipment, buffet table, plates, cutlery, lobster bibs, and more. They set up, serve, and clean up for you. Money well spent. Enjoy your feast! Captain John’s out of Stamford is also “far out” - they offer a large variety of Clam Bake options. They cater a Lobster & Clambake - which includes all your basic Clam Bake staples (lobster, steamers, corn, watermelon and more)for $25.95 per person. Also fully catered is the Surf & Turf -complete with Rib Eye Steak, lobster, steamers, etc. for $31.95 per person. They will also do a Texas Style BBQ ($18.95 per) and even a Picnic Party for 12.50 per person, for parties of 100 or more. Captain John’s also offers a TRAVELIN’ CLAMBAKE for $19.00 per person. For that price, they pack it and you pick it up and cook it. And if you choose to do it at the beach, they rent a portable cooker for $25.00. Stew Leonard's also offers a pretty "rad" Clam Bake special. Their catering department provides a classic clam bake with cost based on market prices which, as of today, run at about $46.99 per person no matter how many guests you have - no minimum from Stew’s. For that price, you pick up your order at the store, already cooked, and take it with you to the party site. Each “dude” gets a steamed lobster, steamers, mussels, corn on the cob, baked potato, hand carved watermelon basket filled with fruit, and a bread basket. Staffing is not provided by Stew’s but they have many caterers who do these parties on the side for an extra fee. Stew’s also offers an old fashioned picnic for $19.99 or Surf and Turf, also for market price. The Stew’s staff were very helpful and suggest that you call to make any changes or additions you might want. Call them and ask for Lisa at 203-750-6168.